BRUNSWICK BLUE FLAME INFERNO BOWLING BALL 15LB. RH - 1 DRILL. Condition is Used. Shipped with USPS Priority Mail. 16 lb brunswick ultimate inferno. Condition is Used. Shipped with USPS Priority Mail. Brunswick Blue Flame Inferno! Low Games! 15lbs! Brunswick Blue Flame Inferno! Low Games! 15lbs!. Condition is Used. Shipped with FedEx Ground or FedEx Home Delivery. Great box spec's! Great Ball at a great price! This ball is a 1st Quality ball with. THIS IS A NIB 15lb. RG and Diff are based off of 15 lb. Hook Potential : 210 (scale: 10-250). 15 LB BRUNSWICK "INFERNO" BOWLING BALL (NEW W/BOX) VINTAGE REMAKE OF A CLASSIC! 5 out of 5 stars - 15 LB BRUNSWICK "INFERNO" BOWLING BALL (NEW W/BOX) VINTAGE REMAKE OF A CLASSIC! 1 product rating1 product ratings - 15 LB BRUNSWICK "INFERNO" BOWLING BALL (NEW W/BOX) VINTAGE REMAKE OF A CLASSIC! Along with the ball you will receive a 3-page letter from the manufacturer as pictured. The note describes how this is the “first reactive 2 piece bowling ball by Sports Tec.”. This ball was to be used for research from actual bowlers as a “performance evaluation.”. Brunswick Category: Mid Performance. 16# RG 2.538 Diff. 050. 13# RG 2.614 Diff. 040. The combination allows this ball to rev early and then break at the mid-lane for a powerful and continuous backend reaction. This ball is a x-out due to the low top weight. Core: Inferno Low RG. 15 LB 3 OZ HYBRID REACTIVE RESIN BOWLING BALL. Brunswick Total Inferno 12 lbs NIB Bowling Ball! Free Shipping! Undrilled! Weight: 12 lbs 2 oz. Top: 2.5 oz. 500 / 1,000 Siaair Micro Pad. No exceptions. ECA-X (Enhanced Composite Adhesion). The Blazing Inferno is a higher RG version of the original Inferno. This shift in weight results in a significantly more cover heavy ball. The RG-min of the Blazing Inferno is 0.068” higher and the RG-diff is 0.017” lower than the original Inferno. Brunswick Ultimate Inferno 14 lbs NOS Bowling Ball! Free Shipping! Undrilled! Weight: 13 lbs 15 oz. Top: 3 3/16 oz. Brunswick Inferno Blue Flame LE 15 lbs NIB Bowling Ball! Free Shipping! Rare! Weight: 15 lbs 3 oz. Top: 1.9 oz. Every item is described to the best of our ability. Together we can work to resolve any issue on a case by case basis. Brunswick Vintage Inferno 1st Quality 15 Pound Bowling Ball 2-3” Pin. Condition is New. Shipped with USPS Priority Mail. 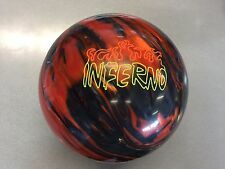 Brunswick Raging Inferno 16 lbs NOS Bowling Ball! Free Shipping! Undrilled! Weight: 15 lbs 15 oz. Note: Original box is missing. #15 Brunswick Blazing Inferno Activator Coverstock. Ball shows wear from normal use but no large scratches or gouged. There is a small crack between the fingerholes but it will be easy to plug. Ball has only been drilled once. Sports Tec Inferno 16 lbs NIB Bowling Ball! Free Shipping! Undrilled! Rare! Weight: 16 lbs 0 oz. Top: 1 3/4 oz. Used, with a couple of scuff marks. Pretty good condition. 2006 Total Inferno 15#. 15 lb 3 oz, TW 3.2, PIN 2-3". NIB = New In Box. 2006 Total Inferno 15#. NIB = New In Box. 15 lb 4 oz, TW 2.7, PIN 1-2". 4 pin, 2 1/8 oz top weight, Visible nicks, especially on older balls. Already drilled. Has a thumb slug with no finger grips. Has been plugged and re drilled once. 2006 Total Inferno 16#. NIB = New In Box. 16 lb 1 oz, TW 3.7, PIN 2-3". Brunswick Scorchin' Inferno Max Activator 16lb. Condition is Used. Shipped with USPS Priority Mail. The bag holds a bowling ball, it is optimally protected on a soft foam ring. In addition, shoes accommodate up to size 43 (US 10.5). Two handles, the bag can be pleasant to wear. Designed for oily lane conditions, the Tenacity will provide exceptional length with the quickest response to friction that will turn heads! Weight Block: Tenacity Low RG. Original Brunswick Vintage Inferno Used 15 Pound Bowling Ball! Designed for oily lane conditions, the Tenacity will provide exceptional length with the quickest response to friction that will turn heads! Weight Block: Tenacity Low RG. NOT DESIGNED TO HOLD A BOWLING BALL.